Google’s Gmail for iOS application has received a big update, bumping the app’s version number up to 4.0 and adding a couple of impressive new features. First up, users of the Gmail app can now archive or reply to email messages right from an iOS notification. As of iOS 8, users can swipe on their Gmail notifications to do this; from here, the notification will reveal a blue “reply” button or a red “archive” button which users can interact with. Gmail 4.0 now also allows users to email content using the iOS sharing sheet, making it easier for iOS device owners to send photos, Web pages, or content from any other application which supports the share menu under iOS 8. You can download the recently updated Gmail for iOS application on the App Store free of charge, and it’s optimized for the iPhone, iPad, and iPod touch (including the iPhone 6 and iPhone 6 Plus). 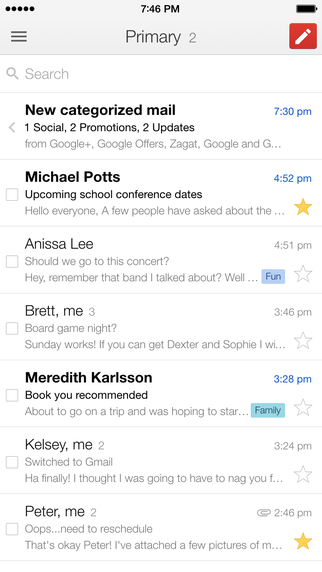 How do you like Gmail’s latest changes? See also: Today’s apps gone free: Temple Run: Oz, Briefcase Pro, Toca Train and more, New Apple Pay FAQ answers merchants’ questions, and Imgur releases iPhone app to browse their image collection.